[German]Microsoft has not too much luck with its Office updates released in November 2018. Two non security updates has been pulled, and a security update causes Outlook 2010 to crash. I’ve described all November 2018 security updates for Office within my blog post Patchday Microsoft Office Updates (November 13, 2018). And the non security updates for November 2018 are discussed within my blog post Microsoft Office Patchday (November 6, 2018). Woody Leonhard already pointed out shortly after the release of the update via Twitter that there are reports about crashes with Outlook 2010. After you install the 64-bit version of this security update, Outlook may crash on start-up. After installing the 64-bit version of this update, Outlook 2010 may crash at startup. Microsoft is investigating the issue and will release more information in time. Currently, the only workaround is to uninstall this security update if you are affected by the crashes. However, I estimate that most users work with the 32-bit version of Outlook 2010, so they are not affected. 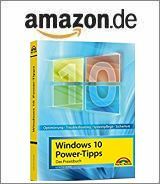 I also received feedback from German readers, that crashes has been observed only under Windows 10 V1803. 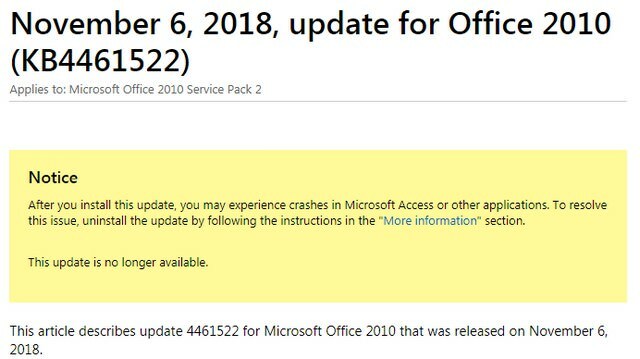 Update KB4461522 for Microsoft Office 2010 SP 2, dated November 6, 2018, is not security relevant. It is intended to make improvements to the Japanese calendar in Office 2010 so that Japanese names are displayed correctly in a new era. Within the KB article, Microsoft now writes that this update can cause crashes in Microsoft Access and other applications. The only option is to uninstall this update. Microsoft has officially withdrawn the update. WZor reported on Twitter (see tweet above) that the update causes an error in the library KERNEL32.dll when calling the GetDateFormatEx() procedure. This entry was posted in issue, Office, Update and tagged issues, Office, Update. Bookmark the permalink. Thank you my good sir :) fixed an issue on a computer I’m maintaining for a friend. Problem with Windows XP, office 2010 and GetDateFormatEx kernel32.dll error reappeared on couple computers few days ago. After some experimenting I found that KB4461614 update for Microsoft Office 2010 is to blame and uninstalling it solved the problem again. Grrrr….Microsoft did it again… I removed KB4461522 some time ago and that seemed to work. Then just recently started getting the same problem. Per your note, I removed KB4461614 and it seems to be working fine. I wonder how long it will be before Microsoft puts in another bad patch. A new Office 2010 security update KB4462157 causes the same error. Once uninstalled however, Office 2010 products are functioning. REALLY FEED UP with Microsoft trying to sabotage office 2010 with every update to Windows XP !!! which of course they say they no longer support LOL ! Perfect! This worked for me. Thank you! Removing KB4462157 fixed the issue for me – now automatic updates are OFF. Microsoft’s policy to deliberately diable Windows XP users stinks…. I removed KB4462157 on 1/24 and everything worked and now today It does not work again I do not have KB4461614 showing on my updates. Were there any other that might be removed to make it work? I had the same problém. After rebooting and restoring the list of updates, the KB4461614 was showed. I have uninstalled it and everything is fine now. Hope someone can help again. I have had the same problems as above as I am running Windows xp and MS Office 10. When I have deleted the problem updates as mentioned above all works fine. Unfortunately office won’t work again ” winword exe entry point not found .” Can anyone help with which updates are causing office programs not to work again so I can delete. Thanking you in advance. Got similar feedback from German readers, but they told, they could not uninstall the update. But I haven’t a constellation with Win XP and Office 2010 to test anything. This configuration should not be connected to the internet at all (for security reasons). Thank You Sam, Uninstall the KB4462174 worked for me.